This innovative study of the role of competition law in the telecommunications industry starts from a classic perspective: While, in principle, regulation benefits social welfare and efficient allocation of resources, past regulatory experience shows that regulation can be flawed and lead to welfare harm rather than good. In the telecommunications industry specifically, inappropriately designed sector-specific remedies and regulatory delays in the introduction of new telecommunications services can hold up the development of the market towards effective competition and could incur considerable welfare losses. In addition, conventional antitrust analysis still lags behind the dynamic nature of the electronic communications markets. • Why a new regulatory framework? • Are sectoral regulation and competition law enforcement mutually exclusive or complementary? • Why should electronic communications markets be regulated to conform to competition law principles? • What does competition law add to sector-specific regulation? • What is the relationship or proportion between regulation and competition law enforcement? An overview of the telecommunications liberalization process initiated at European Community level reveals such problems as a divergent approach of national regulatory authorities in the application of one and the same norms, inability of competition authorities to rightly assess the technicalities underlying a competition problem, and difficulty in carrying out a periodical oversight of compliance with the competition law remedies. The author discusses the legal basis and rationale for the application of the essential facility doctrine to the electronic communications sector, and argues for new regulatory responses to the emergence of collective dominant firms in an oligopolistic setting and to the potential of multifirm conduct to restrict competition through price squeezing and other tactics. The book concludes with a specific case study on the harmonisation of recent Bulgarian legislation with the European Community sector-specific and competition law regimes à propos the electronic communications sector. Effective competition in the electronic communications market is crucial for securing the dynamic role of the entire information and communications technologies sector, of which electronic communications form the largest segment. 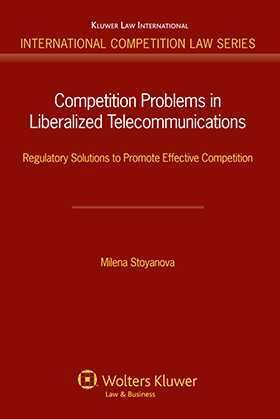 The sound and well-informed recommendations in this book ably address common and persistent problems, making Competition Problems in Liberalized Telecommunications a forward-looking mainstay for practitioners and other professionals involved in all aspects of the field. Introduction. 1. The Over-Regulation Trend and Ways to Avoid It. 2. Relevance of the Essential Facility Doctrine as a Remedy of Anticompetitive Unilateral Refusal of Access. 3. Restrictions to Market Access and Refusal to Supply Resulting from Multifirm Conduct. 4. Prevention of Competition through Anticompetitive Pricing: The Price Squeeze Abuse. 5. Challenges Facing Regulation and Competition Law Enforcement in the Electronic Communications Sector in Bulgaria. Final Conclusion. Bibliography.